On Mizzou, Clairemont McKenna, Yale, etc. Don't send your kid to any college that has any kind of Grievance Studies department. He'll come out broke, stupid, and insufferable. This arrived in the mailbox of a self-employed friend in Pennsylvania. 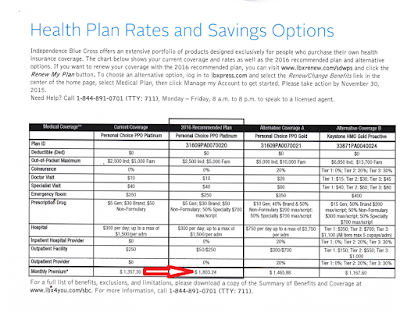 $1803 per month for health insurance! That's 41% of median Pennsylvania household income! And then there are thousands of dollars in out-of-pocket health care costs on top! How is a family supposed to pay for food and shelter? Obamacare is all about destroying entrepreneurism and the upward mobility of the middle class, and forcing people into indentured servitude to the corporations and the state. Government workers don't have to pay $1803 per month. Former Vampire Squidster and TARP bailout bagman Neel Kashkari named President of Minneapolis Dirty Fed.